To say that Bethesda has received some harsh feedback following the release of Fallout 76 would be putting it mildly at best. Fans of the post-apocalyptic franchise criticized the latest instalment for unimpressive graphics, a lack of end game content, and a ton of bugs that to this day still haunt the game. However, Bethesda's biggest mistake came with their apparent bait and switch of the canvas bag they promised consumers that bought the $200 Power Armor Edition with a cheap nylon bag. Fans were, rightfully, upset as they felt cheated and outright lied to by Bethesda. 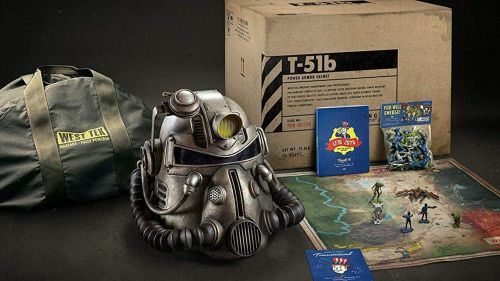 Originally, the Power Armor Edition was supposed to include a canvas West Tek duffel bag with a wearable T-51b helmet. Once those who forked over their hard earned cash for the special edition opened the box, they realized what had happened. Bethesda's initial response to the situation left a lot to desired from an AAA company. A customer sent Bethesda an email soon after purchasing his copy, only to be told by the company that they weren't going to do anything to resolve the issue. We are sorry that you aren't happy with the bag. The bag shown in the media was a prototype and was too expensive to make. We aren't planning to do anything about it. It only got worse from there, as Bethesda offered customers affected by this issue a free 500 atoms. Again, fans weren't pleased, feeling that the $5 of in-game currency in no way comes close to the money that they felt they were tricked into spending. Finally, though, it seems that Bethesda has decided to take some serious action in attempting to right this wrong. The company revealed today that they would be sending replacement bags to those who purchased the Fallout 76: Power Armor Edition. All consumers have to do to get their bag is click the link in the tweet, then select the "Power Armor Edition Bag Replacement Request Form." Fill out the information, and you'll receive your new duffle bag whenever they're ready. We'll have to see how Bethesda handles the rest of Fallout 76's issues from here. But this is definitely a real start on their road to redemption. Does this redeem Bethesda in your eyes? Let us know in the comments below, and be sure to follow Sportskeeda for all of your gaming news!